Russia detained the sailors from the 3 Ukrainian navy ships it seized. Russia has started bringing criminal charges against the sailors from the three Ukrainian navy ships that it seized close to Crimea over the weekend. Twelve of the 24 captive Ukrainian sailors were brought to a court in Crimea’s regional capital, Simferopol, for pre-trial hearings on Tuesday. A judge ordered the twelve sailors to be held until Jan. 25 pending trial, Russian state news agencies reported. They all face a charge of illegally crossing Russia's border, which carries a possible six year prison sentence. Adam Semedlyaev, a lawyer for the sailors, told the Ukrainian television station Hromadske that the sailors would be tried in three groups, the first on Tuesday and a second group in a week. The final group would consist of the six men injured during Russia’s seizure of the ships. Russia detained the three Ukrainian ships on Sunday, accusing them of entering Russian waters as they tried to pass through the disputed Kerch Strait that separates Crimea from mainland Russia and opens into the Sea of Azov. 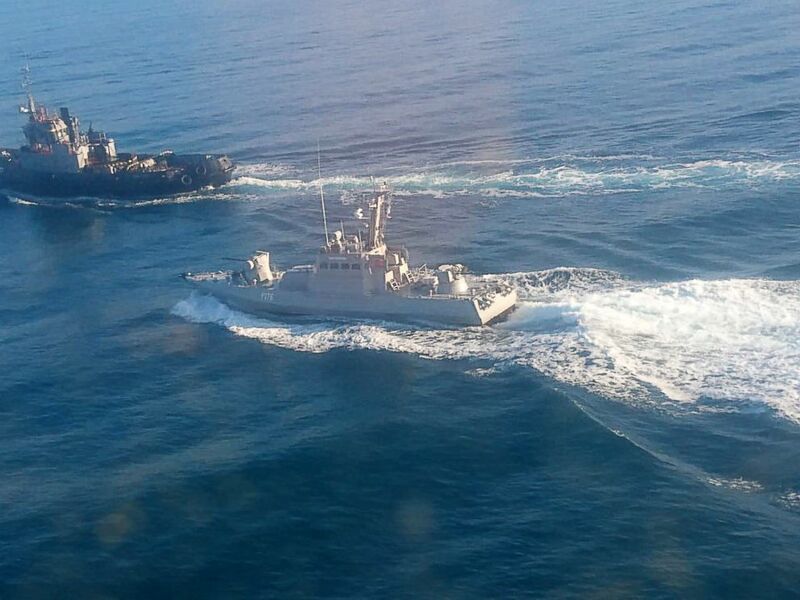 Russian coast guard vessels rammed one of the Ukrainian ships before firing at them. The incident has set off an international crisis, with the United States and European Union countries condemning Russia at the United Nations Security Council and prompting Ukraine’s parliament to introduce martial law in some of its regions. (TASS via ZUMA Press) The Ukrainian Navy has accused Russia of firing on and capturing three of its ships near the Kerch Strait, a narrow sea passage close to the Crimean peninsula that separates the Black Sea and the Sea of Azov, Nov. 25, 2018. Ukraine has demanded that Russia release the men and its ships immediately. On Monday, the Kremlin’s spokesman said that the men’s fate would be decided by a court and indicated it would not treat them as prisoners of war. "This is not the stance of the Kremlin. This should be the stance of a court," the spokesman, Dmitry Peskov, told reporters during a conference call. 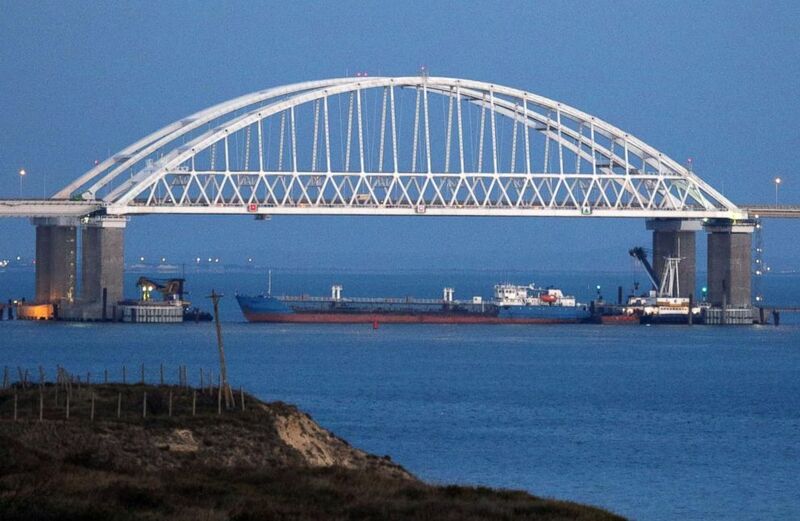 Russia claims that the Ukrainian ships tried to pass through the Kerch Strait without permission as a deliberate provocation. Russia’s deputy ambassador to the United Nations, Dmitry Polyansky, told an emergency gathering of the Security Council that the Ukrainian ships had made a "pre-planned" provocation "in full connivance with western states." Ukraine disputes that, saying Russia had unlawfully blocked its ships in international waters and then attacked them in a deliberate act of aggression. The confrontation is an escalation of a dispute that has been intensifying between Moscow and Kiev over the waters around Crimea. A 2003 treaty designates the Kerch Strait and the Sea of Azov as shared waters between the two countries. Ever since Russia annexed the peninsula, it has begun to exert greater control over it, with Ukraine accusing it of blocking and harassing its ships and those bound for its ports beyond the straits. The three Ukrainian ships-- two small gunboats and a tug-- are being held at the port of Kerch in Crimea. Ukraine's navy said the six wounded men are being treated in a hospital. The country's national security agency, the SBU, also confirmed that some of its officers had been aboard the ships. Russia’s Federal Security Service, or FSB, on Monday released videos of three of the sailors in what appeared to be coerced confessions. In the videos, which were broadcast on Russian state media, the men say they knowingly crossed into Russian waters and ignored repeated requests to stop. (TASS via ZUMA Press) A view of the Crimean Bridge across the Kerch Strait is closed for the passage of civil vessels after there was reportedly an altercation between Russian and Ukrainian ships, Nov. 25, 2018. Ukraine’s navy said the men had been pressured into making the video statements, which they said appeared to have been pre-written. The head of Ukraine's navy, Igor Voronchenko wrote a public letter to the captured sailors promising to bring them back. "It is normal to be afraid," Voronchenko wrote. "The main thing is to believe in your will, defend your dignity and to remember that the entire Ukraine is with you, the entire civilized world." One of the men, Andrey Drach, identified himself as a senior lieutenant in Ukraine's counter-intelligence service and on Tuesday the SBU confirmed that some of its officers had been aboard the ships. The confrontation prompted Ukraine’s parliament to approve a motion on Monday from its president, Petro Poroshenko, to impose martial law in some regions for 30 days. Poroshenko said that the measures were necessary to prepare the country against a possible Russian attack, warning in a statement that there was a “serious threat” of a ground invasion. The parliament nonetheless watered down Poroshenko’s request amid fears that it was an attempt to postpone elections next March in which he is currently projected to lose. MPs limited the period of martial law to 30 days instead of the 60 he had initially sought. Critics though remained unconvinced, warning that the measure was a threat to democracy and noting that even during far more serious moments during the four-year conflict with Russia, Ukraine had never previously needed to impose martial law.